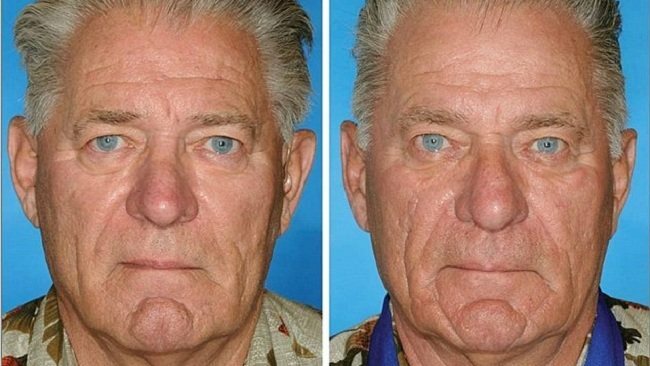 How smoking affects our appearance, ways we can treat this and help stop. This week at Beauty Naturalé we have been looking into the adverse and damaging affect smoking can have to our appearance. 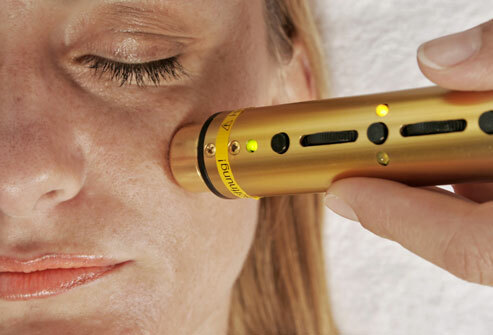 Often offered as a treatment, Anti ageing solutions such as; botox, filler, creams and serums are all quite confusing. Try our 5 minute quiz to see what you know about the signs of ageing, the treatments and remedies available- you may be surprised what you discover. Patches, tablets, e-cigarettes, gum, cold-turkey & hypnosis? As an ex smoker I tried several of these methods to help stop my smoking habits. Quitting is difficult and can often be a long process that not always leaves us feeling at our best. But one of, if not the most reassuring influences in helping me to remain focused to quit was the compliments I received on my improved appearance. Today at Beauty Naturalé we focus on the positive impact quitting can have on our appearance – also we talk about treatments available that can help stop and reverse the cosmetic damage to ourselves. Quitting smoking can improve your appearance. 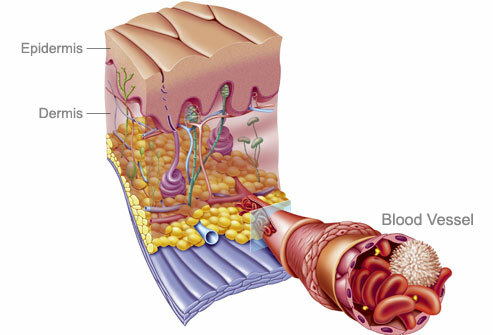 As blood flow gets better, your skin receives more oxygen and nutrients. This can help you develop a healthier complexion. If you stay tobacco-free, the stains on your fingers and nails will disappear. You may even notice your teeth getting whiter. 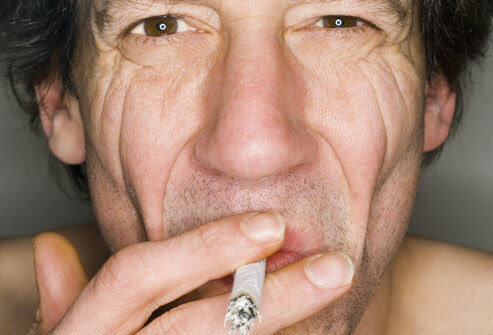 When you quit smoking, you make your skin more resistant to premature ageing. As for the wrinkles and age spots you already have, all is not lost. Keri, the University of Miami dermatologist, says there are products former smokers can use to make their skin look better. These include topical retinoids and antioxidants, such as vitamins C and E. She also recommends wearing sunscreen every day. At Beauty Naturalé we have several treatments available to help recover and reverse the appearance smoking may have left on your skin. Feel free to contact us for a discussion about what we offer, or why not book a free consultation with one of our doctors for a skin assessment and recommended treatment. Coming up next, – we go into more detail about some of our most effective treatments, giving incite from our leading practitioners & clients on the procedures, and as always we let you know more fantastic ways to help you look great and feel beautiful. Beauty naturalé. Following on from yesterdays post, today at beauty naturalé – we are looking at how the side effects of smoking can affect our appearance; from developing unwanted lines and crows feet to sagging skin and eye problems. The studies shown display an array of the aesthetically damaging side effects smoking can have to our appearance, some are quite surprising. There are more than 4,000 chemicals in tobacco smoke, and many of them trigger the destruction of collagen and elastin. These are the fibers that give your skin its strength and elasticity. Smoking or even being around secondhand smoke “degrades the building blocks of the skin,” Keri says. The consequences include sagging skin and deeper wrinkles. Smoking doesn’t only damage the appearance of your face, it can also take a toll on your figure. As skin loses its elasticity, parts that were once firm may begin to droop. This includes the inner arms and breasts. Researchers have identified smoking as a top cause of sagging breasts. Smoking delivers a one-two punch to the area around your mouth. First, you have the smoker’s pucker. “Smokers use certain muscles around their lips that cause them to have dynamic wrinkles that nonsmokers do not,” Keri says. Second, you have the loss of elasticity. Together, these factors can lead to deep lines around the lips. Age spots are blotches of darker skin colour that are common on the face and hands. While anyone can develop these spots from spending too much time in the sun, research suggests smokers are more susceptible. 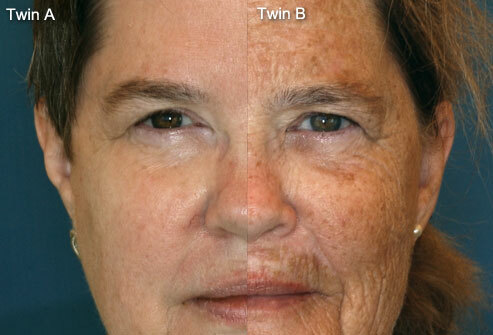 In this image, the twin on the right spent decades smoking and sunbathing, while her sister did not. 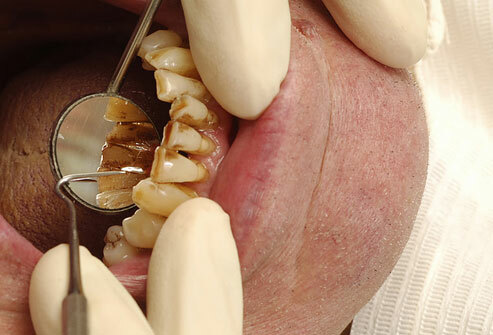 Yellow teeth are one of the most notorious effects of long-term smoking, but the dental damage doesn’t stop there. People who smoke tend to develop gum disease, persistent bad breath, and other oral hygiene problems. Smokers are twice as likely to lose teeth as nonsmokers. Both men and women tend to develop thinner hair as they age, and smoking can accelerate this process. 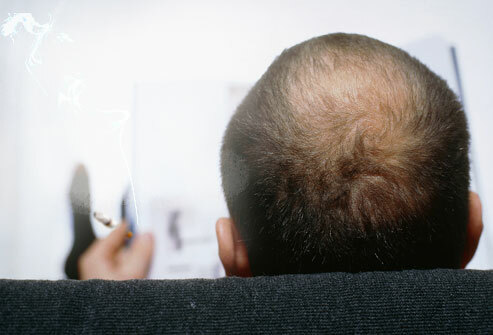 Some studies even suggest people who smoke are more likely to go bald. Researchers in Taiwan have identified smoking as a clear risk factor for male-pattern baldness in Asian men. Even the eyes are vulnerable to tobacco’s reach. 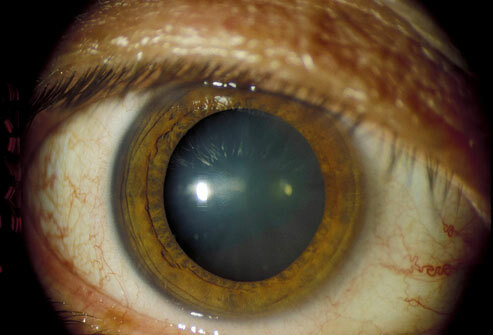 Smoking makes you more likely to develop cataracts as you age. These are cloudy areas on the lens of the eye that keep light from reaching the retina. If they cause serious vision problems, they are treated with surgery. Everyone gets wrinkles on the outside of the eyes eventually, but these wrinkles develop earlier and go deeper among smokers. Heat from burning cigarettes and squinting to keep smoke out of your eyes contribute to visible crow’s feet. Meanwhile, chemicals from inhaled tobacco cause internal damage to the skin structures and blood vessels around your eyes. Cigarettes and other traditional forms of smoking is harmful to our body, the processed tobacco we inhale is cocktail of harmful chemicals that not only causes internal damage to our body it is also the cause of a multitude of problems externally to the eyes, face hair and skin. These sometimes over looked side-effects are often the only visible evidence of the damage smoking can cause to our selves. 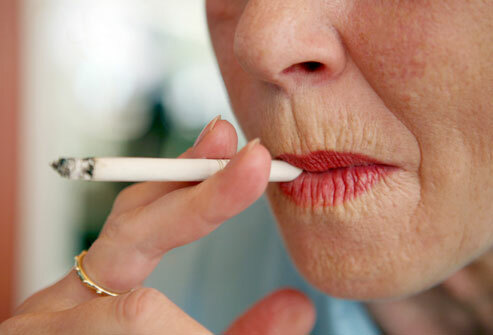 This week at beauty naturalé we will delve into the harmful effects smoking has to our appearance, find out ways in which to combat this and possible treatments. Follow us this week for more info on why and how smoking affects our appearance, what we can do to help this and was we can treat these symptoms and side effects.